EAFRD support for investment in calving facilities has helped an Irish farm to achieve EU standards, enhanced productivity, labour efficiency and control of farm waste, and improved the welfare standards for livestock and general safety. This farm in north east Ireland has been developing since 2000 under new family management. Dairying has become specialised as considerable investment was made in slurry storage, winter housing and milking facilities (pre-2007). Further livestock management and handling facilities were considered important to improve labour efficiency, productivity, animal welfare and operator safety. The farm was part of the Rural Environmental Protection Scheme from 2004-2010. The main aim of this new development was to continue to improve the overall productivity and profitability of the farm business, including: i) improve the cow calving facilities; ii) improve the calf housing facilities; iii) reduce the labour input for calf rearing; iv) facilitate easier management of calving; v)	improve operator safety and animal welfare, and; vi) management of farm waste and run-off from calf facilities. 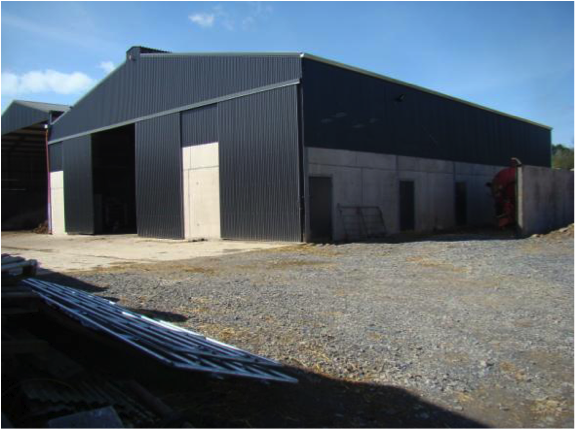 The main activities included: i) the continuation of the ongoing development of the farm facilities; ii) design and development of an integrated calving pens, calf rearing facilities and feed & bedding storage facilities; iii) building of facilities to required standard, and; iv) completion of additional grounds works in the farmyard to encourage seamless integration of the new building into the existing buildings landscape. Reduced labour and ease of management during calving are the main achievements. Currently 100 cows calve annually. The new calving facility allows the operator to comfortably calve cows and is integrated into the winter housing for easier feeding and management. It also ensures that all straw bedding and run-off is controlled and does not pose any harm to the environment. The welfare of cows and calves has improved and there is a safer working environment for the farmer. Often the focus of farm development is on dairy milking facilities, winter housing and slurry storage. Less emphasis is placed on the calving and calf rearing facilities. However, this element is crucial due to its impact on farm labour efficiency, which then affects the overall productivity of the farm. Investment in calving facilities improves animal welfare and reduced stress on the farm operator at key labour demand periods.